Rome, the capital city of Italy, can be described as the physical embodiment of walking into the past. This breathtakingly beautiful city, with its ancient structures and rich history, is a delight to explore for history aficionados and casual tourists alike. In fact, there’s so much to explore in Rome that it can often get a tad difficult to experience everything if things aren’t planning in advance. Another aspect of the experience that can be a little problematic is fully understanding what you’re witnessing and its significance in the city and world. One solution to both these problems is opting for a guided Rome tour. A guided tour essentially means that you’ll be accompanied to the places you visit by a local guide who is well-versed in everything there’s to know about the attractions and city you’re visiting. Most guided tours work out well also because they’re planned to the T and help you save time. 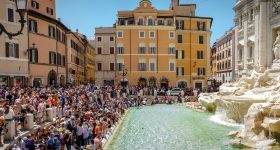 If you’re considering opting for Rome guided tour, here are some advantages you should consider. A whole new world: There are two aspects of any trip to a place, attraction or city. The first is to physically see and experience something beautiful and legendary. The second is to discover the history and cultural significance of the place being visited. What a guided tour does is provide you with a healthy of balance of both these aspects. You don’t just view the physicality of the attraction but learn about how it came about and what it stands for in the city’s scope of things. Expert guidance: Another reason why a guided tour of Rome should be your pick is that you would be accompanied by a guide who truly knows everything there’s to know about the city. So not only can you ask your guide any questions you might have about the place you’re visiting, you can also be assured that you’re going to the right places and viewing the attractions the way they’re meant to be viewed. Facts of the matter: Along with actually viewing the attraction, the one thing that makes a tour special is the little bits of fun facts and figures that come your way courtesy the knowledgeable guide. Not only do these bits of information add some flavor to the whole experience but they also teach you a thing or two about the attraction! Your Rome guided tour will include a guide who’ll keep you informed and entertained throughout the journey. Added benefits: It’s not all talkative guides and walking around aimlessly with a guided tour. If you pick a Rome guided tour that allows you priority access, you can skip the long queue outside the attraction you’re visiting and waltz right in to through the entrance. If that’s not a great selling point, we don’t know what is! Save your precious time by opting for a priority access skip the line ticket and explore even more of Rome’s many attractions. A towering oval amphitheatre, which during its glory days could fit almost 80,000 spectators, the Colosseum is a marvelous representation of the architectural prowess of the Romans. Right next to the Colosseum is the Roman Forum. While now the forum is mostly in ruins, it was home to several important government buildings in ancient Rome. Moving forward, we have the Palatine Hill, the centermost of the Seven Hills of Rome. The Palatine Hill overlooks the Roman Forum and stands at a height of 40 metres. • Get priority access to arguably the biggest attraction in Rome; the majestic Colosseum. • A English or French-speaking guide will accompany you on the tour, giving you an intimate peek at the amphitheatre history. • Also included with this tour is priority access to the Roman Forum and Palatine Hill to give you a great Roman experience. • The tour lasts for a total of 90 minutes, giving you plenty of time to explore the Colosseum. • Explore the monolith of Roman architecture, the Colosseum with this economical guided tour that also covers the surrounding archeological area. • Get skip the line access to the Colosseum and save your precious time by not waiting in queue for hours. • The combo also gives you priority access to Roman Forum and Palatine Hill. • You’ll also get wireless audio headsets with this guided tour to make your experience even more fulfilling. • This high demand tour has limited availability and often sells out months in advance, hence, pre-book your spot to secure your place on this exciting VIP tour. • On your VIP access tour, explore the Colosseum underground & arena floor, Capitoline Hill (piazza del Campidoglio) with Roman Hill overlook, via Dei Fori Imperiali, Piazza Venezia, Vittorio Emanuele II Monument, Mussolini's balcony and imperial thoroughfare. • Your 2 hours 45 minutes tour includes a visit to the Colosseum plus a walking tour of ancient Roman surroundings. • Witness the Colosseum at night on a private small-group tour with 23 people or fewer. 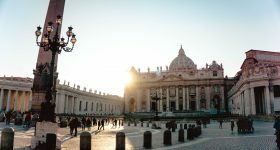 Given that the Vatican is important destination for Christians, you can expect to see some of the most famous churches and chapels in the city. The first would be St. Peter’s Basilica, one of the holiest Christian shrines in the world. The Sistine Chapel is a chapel in the Apostolic Palace, the official residence of the Pope, in Vatican City. Next up is the Vatican Museums located within the city limits of Vatican City. The Vatican Museums house some of the most famous pieces of art of our times including Roman sculptures and Renaissance art. • Visit one of the most important Christian shines in the world; the Sistine Chapel and the glorious mecca of art, the Vatican Museums with this killer combo deal. • Avoid waiting hours in queue and walk straight past the security area to the entrance with this guided tour that gives you skip the line access to both the Sistine Chapel and Vatican Museums. • This guided tour come with live audio commentary that you can hear through the headset that’ll be provided to you at the start of the tour. 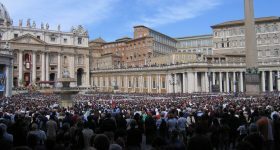 • Gain access to a special entrance to the Basilica of San Pietro from the Sistine Chapel. • Discover the glorious past of Christianity with a convenient and economical combo that’ll take you to St. Peter’s Basilica, the Vatican Museums and the Sistine Chapel. • Walk past the annoying queue waiting for you at all three attractions and save time which you can then use to explore these places in peace. • A professional guide who has speak English, French, Spanish, and German will take you on an interesting journey of learning and enlightenment. • The tour also comes equipped with individual wireless headsets for all guests. 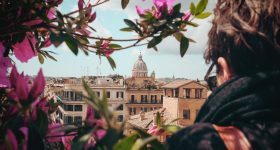 • If you hate crowds and wish to have a relatively private experience at some of Rome’s most iconic landmarks, this early access combo is your best bet. • Enter the Vatican Museum at 8:00 am, one hour before to opens for the general public and take a leisurely tour of the legendary museum. • This guided tour also gives you priority access to St. Peter’s Basilica which means no wasting time waiting in queue for you! • A trained and knowledgeable guide will be with you all through your trip to all these landmarks of Roman history. • Visit the marvelous attractions that define Rome with a small group tour that gives you the privacy you seek at a reasonable cost. • Get priority access to St. Peter’s Basilica, Vatican Museums and Sistine Chapel and skip the security check queue. • Explore these icons of Christendom with a professional guide who knows everything there’s to know about all the attractions you would be visiting. • You can also ask for a complimentary audio headset when needed if you’re having trouble keeping up with the guide. • Discover the beauty and charm of one of Rome’s greatest museum of art, Villa Borghese Gallery. • This skip the line combo tour helps you avoid the annoying security queue and helps you save time that can be used to better explore the expansive gallery. • Take a leisurely stroll through the lush green gardens as the trained guide educates you on the history associated with the museum. • With groups of less than 20 people, this Rome guided tour is perfect for people looking for an intimate experience and want to avoid crowds. • Explore the historical Borghese Gallery with an expert English-speaking who’ll teach you a thing or two about the museum with their animated and passionate narration. • Each guided tour can have a maximum of 15 people, which means you don’t have to worry about being in a crowded tour. • The tickets in this guided tour are of the skip the lines variety so that you can skip the annoying queue and walk straight to the entrance. • After your trip to the museum, take a pleasant stroll through the gardens outside the Borghese Gallery. • Explore the thrilling catacombs and crypts that are layered up under Rome and discover the other side of the generally beautiful city. • Follow the professional guide as he takes you to all of Rome’s underground landmarks and discover the history behind their existence. • Included in this tour are the Catacomb of Santa Priscilla, the Capuchin Bone Crypt, and Basilica San Clemente. • Free transport is provided to all the attractions covered under this combo package and you’ll get to travel in an air-conditioned mini bus. • Get priority access to San Clemente Basilica and the Catacombs of Domitilla with this skip the line guided tour. • Visit two of Rome’s top attraction with this three hour walking tour where you’ll be accompanied by a knowledgeable art history guide. • The guided tour only handles small group sizes with a maximum of 16 people, which means you can expect a relatively intimate touring experience. • To take you to both the destinations, transport will be provided. During the summer months, an air-conditioned coach will be arranged. • Discover everything that makes Rome special with this guided tour of the city’s historic center and the its iconic sights. • The city tour covers landmarks, such as Trevi Fountain, Pantheon, Spanish Steps, Piazza Navona and more. • An English-speaking guide will be with you during this walking tour and you expect to learn Rome’s rich past by the time the tour ends . • The tour includes a stop at one of Rome’s many piazzas where you can try a traditional Italian gelato, coffee, or aperitivo. • A truly unique walking tour that takes you on a journey to better acquaint you with the food available in Rome. • This personalized food tour hosts only a group of 8 people at a time which means you won’t have to worry about being part of a packed group where the guide is unable to give individual attention. • Stroll through Trastevere, one of the most popular localities in Rome and learn more about what goes on in each dish that’s served. • Samples are available for trying in the places you’ll be visiting as a part of the food tour. • Go on a round trip from Rome to Pompeii and Mt. Vesuvius in an air-conditioned bus. • A trained and professional English-speaking guide will be with you at all times to enlighten you about the places you’re visiting and answer any questions that you might have. • Once you reach the location, the tour will only have 25 people or less. This ensure that overcrowding doesn’t happen and everyone has a pleasant and valuable experience. • The combo deal includes lunch where you on gorge on traditional Neapolitan Pizza and a drink of your choosing. • Head to Pompeii and Amalfi Coast on a comfortable air-conditioned vehicle with a group of 15 people or less. • Make good use of your professional guide and learn everything there’s to know about the glorious history of Pompeii. • Don’t waste time standing in queue at the archeological site of Pompeii. These skip the line tickets will take you straight inside. • Apart from Pompeii, this tour also includes a visit to the mesmerizing Amalfi coast, which displays Mediterranean splendour in all its glory. • Visit Florence, an official UNESCO world heritage site, from Rome for one full day in a high speed train. • Get dedicated entry to the Uffizi gallery and avoid wasting time at long queues with your skip the line tickets. • Enjoy an appetizing meal at a restaurant with the glorious Piazza Santa Croce as the backdrop. • Learn everything there’s to know about Florence with the professional guide who’ll meet you at the train station. • Take a high speed train from Rome to the city known for its mesmerizing architecture and streets; Venice! • You’ll be accompanied on your Venice adventure by a professional guide who knows everything there’s to the city and will provide additional assistance as and when required. • Get skip the line tickets for the legendary St. Mark’s Basilica and take your sweet time exploring the landmark. • The full day tour of Venice also comes with a 12 hour pass for the Vaporetto, the city’s water bus! • Set off from Rome for a full day at charming Tuscany and have your fill of the city’s glorious history, ancient religion and architecture. • Your expert guide will take you on a walking tour of Montepulciano and share the city’s history with you. • Your journey to and from Rome to Tuscany will be on a private coach with a group of 25 people or less, making it a personal and intimate experience. • The Tuscany full day trip includes a 3 course meal and you’ll also get to sample some spectacular Brunello wine. Are there any guided food tours? i’m visiting rome this summer and would love to try it out!